Thank you for visiting my website. Here, you’ll find out about my writing and my books. My husband and I have lived in an 18th-century farmhouse in the countryside of Southwest France since 1997. The history and landscapes of France and Corsica provide huge inspiration for my writing. The House at Zaronza, my first novel, is based on an intriguing true story that we discovered when holidaying on Corsica. It’s set in early 20th-century Corsica and at the Western Front during World War I. It was reissued in April 2018 in paperback and Kindle versions, with a new cover and minor editorial changes to the text. My second novel, The Corsican Widow, is set in 18th-century Corsica and Marseille and was published in May 2018. It is available on Amazon Kindle. 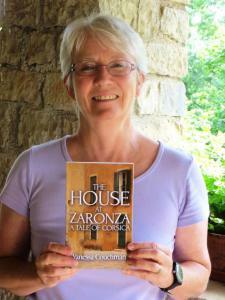 A sequel to The House at Zaronza, set in World War II, is on the drawing board. I also write short stories and a collection inspired by and set in France, French Collection: Twelve Short Stories was published in November on Amazon. You can also find it on Barnes & Noble, Kobo, Apple amd other online retailers. You’d be amazed by how much literary endeavour goes on in the wilds of Southwest France! I belong to the local Parisot Writing Group and a book group. I was also a founder of the Parisot Literary Festival in 2013, now an established annual event in the literary calendar. Contact me via the form under “Contact me” or connect with me on my Facebook Author Page, Amazon Author Page, Twitter or Goodreads.